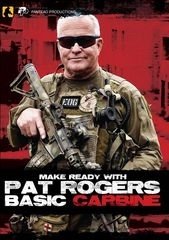 Recently I noticed there are a lot of firearms training DVDs coming out from some pretty big names in the industry. While I agree there has been a bit of a boom in celebrity firearms instructors, I think most of these guys are class act and the majority have some really good info for novice and expert levels of experience. I remember talking to Fernando Coelho years ago about getting some credentials in the industry and he told me the first thing I should do is take a course with Pat Rogers or Larry Vickers. Since I’m married with kids it’s been really hard to take a 3 or 4 day course out of State, but now that Panteao Productions is kicking out a DVD a month practically, I’m trying to swallow up the time to be able to watch all of them. I think most people in my age group have the same issues, it’s money or time that they don’t have enough of but for $50 or less you can find some point during the day to watch these DVDs in stages or after the kids go to bed. I have only been able to watch about a dozen of the Panteao DVDs from Make Ready with Travis Haley, Make Ready with Paul Howe and all of the new Pat Rogers training ones. The Massad Ayoob DVD about Home defense is an excellent DVD to watch and give as a gift to someone that has no idea how the criminal mind works and how to prepare your home for threats.